Let your protein intake be spread out through the day rather than being loaded up in a single meal or in a supplement. Let your protein not take up more than one third of the plate. 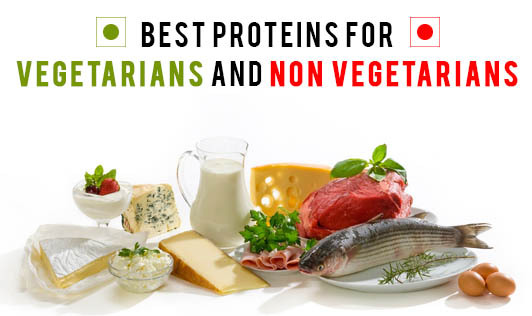 Non-vegetarians can choose lean forms of protein with minimal fat baggage. Lean animal sources include red meat without marbling, poultry without skin, skimmed or low-fat dairy products, and fish. The servings from these meat sources should not be more than 2 palm sizes a day. Vegetarians can use soy-based foods like tofu, roasted soy nuts, or cottage cheese. The plant sources include beans, black beans, lentils, split peas, and whole grains. These are the healthiest foods on the planet that are economical, filling, and easy to make. There is an important thing for vegetarians to note when concerned about the quality of protein they consume. Unlike animal protein, plant proteins are ‘incomplete’, which means that they lack certain amino acids. Vegetarians can overcome this shortage by combining the aforementioned foods with other plant cereal proteins to obtain 'complete' proteins with all essential amino acids. Combinations like rice and sambar, rice and dal, idli and sambar, and chole bathure work best. These combinations of foods make vegetarian proteins complete. Regardless of being vegetarian or non-vegetarian, it is important to eat food wisely and in the right combination.